Due to the sour attitude among some of our readers I cross out the text on my initial thoughts on the XC 90. It was no comprehenisve Road & Track test. Just what I could see and feel after a 5 minutes sitting in the car. I described what I could see from a Human Factors / Decision making and some haptics. I know that field of technology. Volvo showed the car in public with open doors for the forest time at the Stockholm Car Show. I was invited to see that car 4 months ago at the Volvo Stockholm City Showroom, at that show the doors where closed. Maybe the should have bee closed this time as well. The quality felt very chinese, plastic flimsy. Like the plastic part between passengers seat and the center console with shifter etc. The input device for the info/com system felt very awkward with rolling stuff that was so slick that it could not be properly operated. The car was apparently a test/mock-up car. What is going on in Göteborg at the Volvo plant. Is it so hard to get a complete car for this public event. The car looks pretty much like any old Volvo to me no real new thinking here. Well this is the most modern Swedish car out on the market but be aware the parts content is getting more and more chinese. One of my favorite comedians, Jerry Seinfeld, has for the past few years been heading up his own little web-tv show where he is inviting various colleagues for a ride in an interesting car and a cup of coffee. And, in season five, they finally feature a proper car: A two stroke Monte Carlo 850. I wonder if we will see Jerry return with a black 900 one of these days? Black Saab rules! My favorite US radio program CarTalk has lost one of the two Magliozzi brothers Tom and Ray. Tom just recently passed away in Alzheimers disease. The two brothers has given me so many hours of great car talk. Any brand and owners are helped or roast by the two guys. I remember most clearly a guy with a SAAB 99 calling in to the programme. The issue with the 99 was explained something like this. “In sweden it is dark most of the year and the workers in Trollhättan happened to mount the engine on top of the gearbox and to add more issues the put it in the wrong way with the clutch just behind the radiator” I had a great laugh. It seams like quite a few of callers where from the east coast and drove cars like Volvo, Saab or european cars. RAY: Well, here’s the key question, Angela: After the muffler exploded, did the car run better? TOM: If so, the muffler might have been the source of the sluggishness. Often what happens is that when a catalytic converter fails, its innards disintegrate and get pushed farther down the exhaust system, where they can lodge in the muffler baffles and plug it up. RAY: That would cause exactly the symptoms you describe — the car would be sluggish when climbing hills or accelerating. If the tailpipe is blocked and the engine’s exhaust can’t get out, the fresh fuel and air have no room to come in, so the engine bogs down. TOM: So both your catalytic converter AND muffler might have been clogged. And when your mechanic replaced the converter, the acceleration improved a little bit, but the pressure on the muffler multiplied. At some point, the pressure got to be too much and the muffler burst at its weakest point — the seam. RAY: While that makes you unwelcome in most bedroom communities after dark, it also allows the exhaust to escape. So the car should run better. And once you replace the muffler, you should be all set. TOM: Mufflers sometimes explode due to backfires, caused by too much unburned fuel in the exhaust system. But given all the corroborating symptoms you have, I’m betting yours was just badly clogged. Next time, try Mufflermucil. The following story is not Saab related but it arrived in my in box and I wanted to share it with you and then ask,,, What’s the longest you have owned a Saab? Me, well we have had our black 9-5 Aero Estate for 11 years, so far. Allen Swift owned and drove the same car for eighty-two years. Allen, of Springfield, Massachusetts received this 1928 Rolls-Royce Piccadilly-P1 Roadster from his father, brand new —– as a graduation gift in 1928. 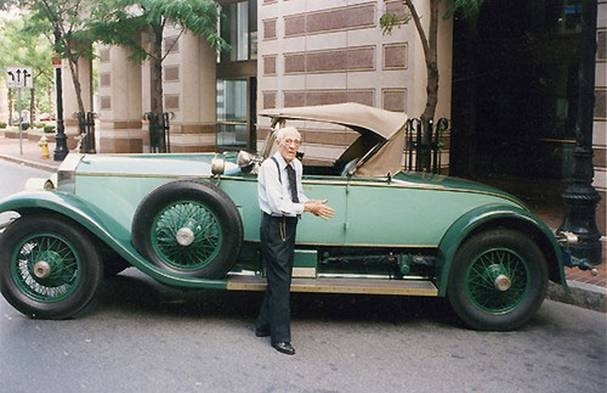 He drove it until his death last year…..at the age of 102 !He was the oldest living owner of a car that was purchased new. It has 170,000 miles on it, still runs like a Swiss watch, dead silent at any speed, and is in perfect cosmetic condition. That’s British engineering of a by-gone era. Relationship? It may sound strange. But if you really think about it, that’s exactly what we have, a relationship. The thought struck me today during my visit at the Veteran market in Nossebro (Essunga, Sweden). I found myself in a frantic tunnel vision, I was so busy searching after everything that had something to do with Saab (occurs very often). To society, the Veteran market is a market full of classic cars, moped parts, car parts and nostalgic stuff. I had to stop myself when I realized my eyes searched through the area to see how many Saabs I could find in place. And that overwhelming feeling of joy when I laid my eyes on a Saab got me thinking. I don’t know if I’m slightly insane who feels this way, but isn’t the honest truth that we actually do have a relationship with Saab? Through the years, we’ve been standing united side by side through success, setbacks, sorrow, joy, disappointment, hope and promises. The feeling that always consists is the joy and pride among the people, the will to preserve the history of Saab, the passion, the cars and the feelings. The whole deal is pretty amazing, in my opinion it is very much like a relationship. To me, Saab has been very rewarding in many ways, I’ve met many like-minded friends (including my soulmate), I’ve gained a new perspective on things in life. And the things Saab enthusiasts have in common is the passion, the fire that has been kept alive for so many years. I admire the enthusiasm and strength among the Saab people, the fighting spirit, the soul within the cars, the link between the car and driver, and the story behind it. And I am forever grateful for everything Saab has giving me and continues to give, and I know that I am not the only one who feels this way. Tim is at this moment heading for Trollhättan to talk to representatives from NEVS. Feel free to ask your questions in the comments section and we will do our best to get answers.